Memories flow back to me as I board the Airport railway from Chitose Airport into Sapporo City. The breeze in the air, and the nature surrounding Hokkaido area is just refreshing. It takes just 30 minutes to get into the city so it’s really convenient. I was staying at Sapporo Park Hotel located right outside of Nakajima Park. They have really decently priced single person rooms and is conveniently located and walking distance to the main areas (such as Susukino, Tanukikoji Street, Odori Park, and Sapporo Station) I noticed there were more foreigners working in Hokkaido nowadays. They were blond haired, probably from across the ocean from Russia. They spoke Keigo Japanese (polite Japanese) with almost no foreign accent, and had the mannerisms and politeness of Japanese staff. I visited a small Fushimi Inari Shrine. The most famous one is located in Kyoto! Ever since I was there, I couldn’t stop visiting other similar sites. It is such an iconic representation of Japanese culture. It’s a little bit more difficult to get to, but you can get there from Nakajima Park via bus #56, or from Maruyama Park via bus #10 or #11. These busses don’t run very often at all, especially not on weekends. So it’s good to go to the bus stop to check the schedule beforehand. Fushimi Inari Shrine is one where there’s red Toori (gates) one after another. The Fushimi Inari Shrine is quite small and not very well maintained though. There were no one around when I was there, so naturally no Omikuji or Omamori available. Nonetheless, the walk through the red Toori was really amazing! I also visited Hokkaido Jingu. 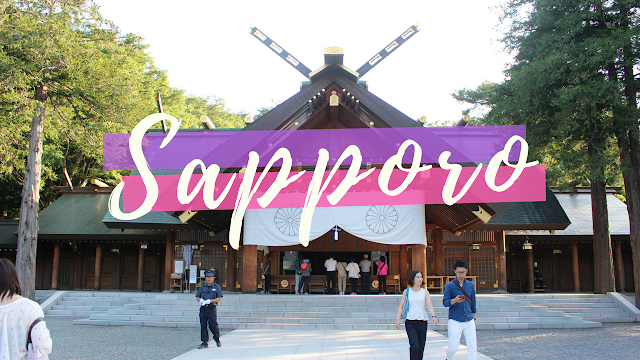 A trip to any Japanese city is never complete without visiting temples. I especially love to draw Omikuji (fortune paper) and also getting Omamori (lucky charms) for whatever type of wish I am wishing for at the time. I was very lucky and drew a Chu-Kiichi, which is 2nd or 3rd level of good luck! I also got a Health lucky charm for my partner since he hasn’t been feeling very well lately. I wouldn’t say I’m a very religious person, but for me it’s more a gesture. Plus, the Omamori from Hokkaido Jingu is beautiful! I also ran into some kind of parade they were running for a celebration, though I wasn’t too sure what it was for. Three years ago, I didn’t get to Mount Moiwa. Originally I was going to hike up, it takes just 75 minutes, but it was getting dark and cold really quickly, so I took the ropeway both ways. I didn’t want to get lost and stuck somewhere in the mountain alone. Sunset was to be around 6:40pm, but it wasn’t completely dark yet. I was up there waiting for almost an hour, but it was simply too cold. Nonetheless, watching the sunset and the city slowly lighting up in prepare for the night was an experience I never tried before. The lights twinkled in the distance, and eventually you could see the Sapporo TV tower and the neon colored Ferris wheel in the city center light up. The Mt.Moiwa rope way also had a really hilarious mascot, it looked like a really fat bunny. Once I got down from the mountain, I took the tramway back into the city. This was my first time riding the tram in Japan! It’s actually really efficient and was really comfortable to ride in! The seats were horizontal along the two sides, and it made me think of the Cat Bus from Totoro! I got off at Tanukikoji street. It is one of those iconic Japanese indoor shopping streets “Shotengai” 商店街. Tanuki means the Japanese raccoon, so the road was decorated with raccoon related items for the Summer festival. There was a super big inflatable Tanuki on the ceiling, just like 3 years ago! Tanukikoji is around 1km long and has over 200 shops. These shop range from restaurants to gaming centers, souvenir shops, karaoke and massage places. Also there was one fruit stall that sells really good Japanese melon and peaches! Definitely worth trying! Back on Odori Park, just a few blocks away from Tanukikoji, the Summer Festival continues. There’s 11 blocks of grass and park space stretching from East to West of central Sapporo. There were beer gardens from various different Japanese beer brands, and also an area for 盆踊り Bon Odori! Bon Odori is a dancing activity that Japanese people do during Summer Festivals. People dressed in Yukata dance around a tall stage and circle it in counter clockwise. There are set dance moves that are easy to learn but vary from different regions. In the center stage there are Taiko Drummers, Japanese flute players, and singers. The Bon Odori goes on for 3 hours and people from all ages, races, in all kind of clothing join in the dance. There were some “Salary Man” or Japanese office workers dancing in suits, there were some really elegant ladies dancing in their yukata, and some really passionate old men dancing with various matsuri masks. There were also little kids, foreigners, and even a big mascot doll! The overall atmosphere was just so welcoming and heart warming! People were smiling and laughing and just enjoying their time. I joined and dance around 3 circles, it’s probably the best thing I’ve participated in Japan so far! In the next blog post, I’m going on a day trip to the city of Otaru, it’s famous for its Canals especially! Follow me on Instagram for more Hokkaido photos!